The more you push yourself, the more you relapse. Pacing is the process of monitoring your energy level and restricting or expanding your activities accordingly. It sounds simple enough but in practice most people find it a bit tricky to master. Chronic pain forces you to get to know yourself in a deep and detailed way. When you begin pacing, it’s important to understand what your natural pattern of energy is. You’ll need to know when you are at your best, and when you are most tired. Are you a lark (an early riser) or an owl (more energy late in the day)? Are you prone to the midafternoon slump? Do you collapse after your evening meal? Next, you’ll need to consider how this natural pattern has changed because of your condition. If you have always been a lark, is morning still your best time of day? Do you experience more energy dips or just more severe ones? You can use the Energy Level Assessment to get a detailed understanding of your current pattern. Know your limit, stay within it Before you can respect your limits, you have to know what they are. The Energy Level Assessment has helped you to recognize your usual pattern of ups and downs. Think about how these can change when additional factors come into play, such as illness and stress. Banish Energy Thieves “Energy Thieves” are activities, people or thoughts that leave you feeling drained. Before you accept an obligation for an activity or social encounter, notice how your energy level responds to the idea of it. Ask yourself how you will benefit from it. If your energy rises and the benefit is clear, then use your other pacing strategies to get the most from the experience. If your energy falls and the benefit is unclear, it may be time to say “No, thank you”.But what do you do when the Energy Thieves are your own thoughts? This is where self-management techniques such as Cognitive Behavioural Therapy come in. Use these techniques to reframe your thoughts and avoid unrealistic negativity. 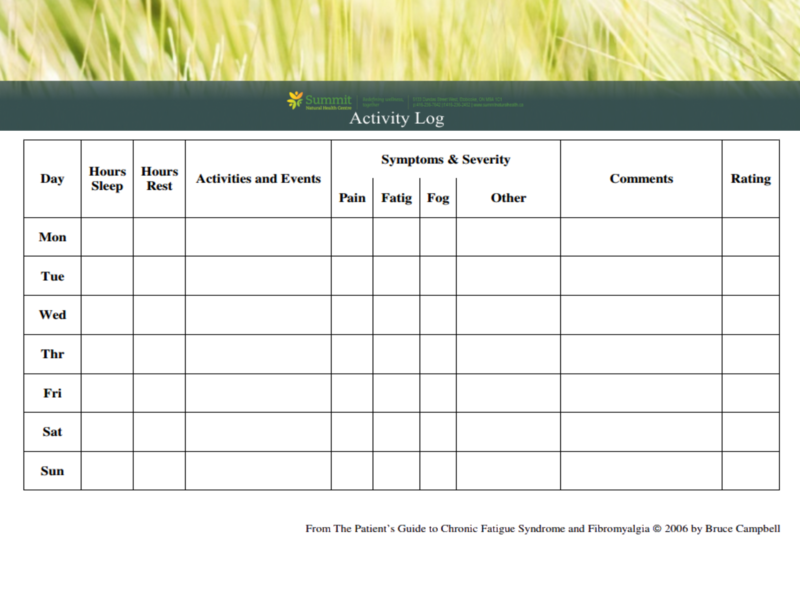 Control Symptoms – a tracking sheet can help identify relationships between symptoms and activities or emotional events. Motivation – a tracking sheet can provide inspiring proof of how symptoms respond to your pacing efforts. Reality Check – a tracking sheet can help make limits seem real so you are less likely to push yourself. Document and Explain Your Illness – these records can document your functional level and show changes over time, which may be useful in discussions with physicians and for substantiating a disability for insurance purposes. Developing routines is another fantastic way of keeping balanced and committed to self-care. The more healthy habits you can create, the easier it will be to look after yourself when brainfog symptoms emerge – no decisions necessary when your habits are in place! Prioritizing is crucial for self-management. You won’t be able to say “Yes” to every request that comes your way. Set priorities that reflect your values. Consider the “Death Bed Test” – if this was your last day on earth, how would you want to spend your time? For example, would you rather spend your time washing the kitchen floor or laughing with loved ones? Do the things that mean the most to you. Preparing for an activity can reduce your stress and limit fatigue on the day of the activity. Spread your preparations over several days if possible so you can be your best for what you want to do.